It’s time for the second half of the WFTDA 2016 Division 1 playoffs. Following Montreal and Columbus, we’re headed back north of the border into friendly Canada, stopping in Vancouver, British Columbia for round 3 of 4. The venue for the event is very appropriate. The Richmond Olympic Oval hosted the speed skating competitions at the 2010 Winter Olympics in Vancouver. The fastest skating athletes in the world competed on a 400m oval track for gold, silver, and bronze Olympic medals. Some of the best roller derby teams in the world will playing at the facility in the WFTDA playoffs, though they won’t be on ice. Athletes will still be skating for gold, silver, and bronze medals, though. The track is a bit shorter—55m, thereabouts—but an outfit of blockers will be doing everything in their power to make opposing jammers feel as if it’s a mile around. These skating revolutions will be televised, on your computer or mobile device through WFTDA.tv. It’s too late to take advantage of the WFTDA playoffs season pass, but you can still access the 17 games from Vancouver via PPV for $16. The live audio stream, along with video archives of past playoff games, is available through the WFTDA YouTube page and is always free. Our Olympic-sized preview of the ten teams participating in this weekend’s play is coming up. But first, as always, here’s a statistical interlude of an interesting trend we’ve noticed over the last few playoff years. At Lansing in Division 2, teams committed the most penalties ever seen during WFTDA tournament play. The week after that in Division 1 Montreal, the derby was some of the cleanest seen in years, possibly ever. Last weekend in Columbia, things fell somewhere in the middle, with an average of 70.3 penalties per game. That’s higher than Montreal, but still well below what WFTDA derby has been averaging lately. It’s great that fewer penalties appear to be the norm going forward (Lansing notwithstanding, knock on wood) but there’s a curiosity that comes with it, one that’s been developing over the last three years. A jammer is one of five players on the track for a team at any given time. It should follow that a jammer skater—or any one skater on the team, regardless of position—would receive an average of one in five penalties that team commits over the course of a game. To our surprise, this is exactly what happened during the Division 1 playoffs in 2013 and 2014. The jammer penalty ratio, or percentage of penalties committed by jammers, was 19.9% and 19.6% in those two years, respectively. Division 2 had a ratio of 20.9% in 2013. That’s pretty much exactly one in five penalties. This started to change last year. In Division 1, the share of jammer penalties increased to 22.1%. In Division 2, it was 22.5%. These ratios increased similarly, despite overall penalties going down in D1 and going WAY up in D2. So far this year, the jammer penalty ratio has increased yet again. In Division 2, it’s ticked up to 23.1%. In Division 1, it’s all the way up to 24.3% through two tournaments. That’s nearly one out of four penalties being committed by a jammer. Though everyone is committing fewer penalties than last year, blockers (-14.2% vs. D1 2015) are skating significantly cleaner relative to jammers (-4.3%). Blocker penalties are obviously down…and jammer penalties are obviously not. We’ve heard some people complain about the number of jammer penalties in games during the Division 1 season. This is a valid complaint for the four games that had more than 20 power jams, but for the most part the number of J-pens just seems higher when you compare it to the number of overall whistles being blown by referees. This ratio has significance in the area of game balance. Since it appears as if blockers have started to figure out how to skate cleanly with the rules they’ve been given, it should follow that jammers would follow suit. That hasn’t happened yet. If we see another year or two where blocker penalties continue to go down at a higher rate than that of jammer penalties, and the jammer penalty ratio continues to increase past 1-in-4 to a level nearer 1-in-3, that’s a signal that jammers should get some relief through rule changes, where possible, to help keep them on the track as much as any one of the other four players on their team. Jammers have enough of a targets on their backs as it is. Rules that over-penalize them, relative to the other players on the track, shouldn’t add to their troubles. It will be interesting if the 2017 WFTDA rulebook does anything to give jammers a break, such as relaxing cutting penalties, to help bring the ratio back to a more balanced state if it doesn’t happen through natural means. 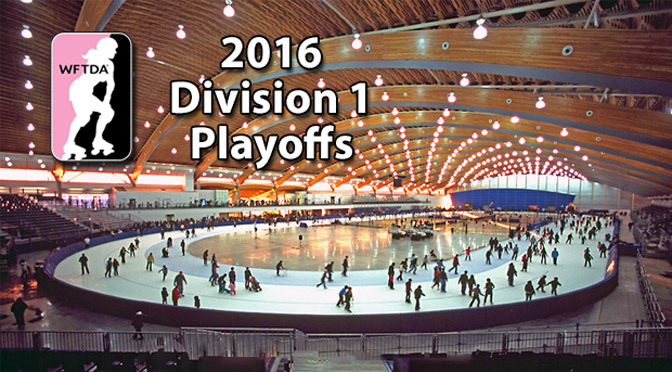 Inspired by the Olympic Oval, our Vancouver Division 1 preview will be handing out medals to everyone playing this weekend. These aren’t real medals. These aren’t participation medals. These aren’t the actual gold, silver, and bronze medals the winners will get to wear around their necks. Our medals are more like a temperature gauge of how well we think each team is going to do. Do they have a shot of getting to Portland? Will they leave with a result that’s better than their ranking? Will they bottom out? Here’s our medal tracking table, with the main bracket and capsule previews for each team. Going for Gold – Teams that have a legitimate chance of competing for or earning a spot at WFTDA Championships. This may be more than three teams. Settling for Silver – They won’t make it to champs, but will likely hold onto or improve on the seed they entered the tournament with. They’re not the first losers, they’re the last almost-winners. Begging for Bronze – Teams that may drop a few spots from where they started the tournament. Someone’s got to finish last, but that’s better than not finishing at all. The best team in Australia, and third best in the WFTDA, is looking for a shinier medal come November. They beat London last year in Minnesota to take the bronze, but was thisclose to taking out Gotham the night before and securing a berth in the championship final. Victoria’s difficulty in consistently playing against top competition could have been the difference, as VRDL only makes one trip out to the States to see how they stack up. This year at the The Big O, they faced two equal opponents in #4 Rose City and #6 Texas. Both games were extremely close, with the Aussies beating Texas 130-114, and Rose City 150-138. Bless Dragon City, but playing a game like that isn’t that far off from playing against nobody at all. This weekend, VRDL will need to remember how to play against tangible opposition and how keep up those ridiculously stifling defensive formations against jammers that know how to break them. That shouldn’t be too much of a problem for them, however. Expect Victoria to go for the gold this weekend, and pick up a bye at champs while they’re at it. The Angel City Derby Girls of Los Angeles have a pretty consistent schedule each year, playing many of the same teams annually. Among them, #11 Bay Area at Pac Destruction (226-92 win), Texas at The Big O (145-63 win), and #12 Rat City at Hometown Throwdown (148-142 upset loss). Two more games are pretty big ones when judging Angel City’s chances in the playoffs, and at Champs, too. Also at the Throwdown, Rose beat Angel 206-155. Though it was very near the expected result, it’s a result close enough where the upset potential isn’t far-fetched. Angel City’s 183-94 loss to Victoria at The Big O, however, is margin large enough where VRDL shouldn’t be too worried about a rematch. What Angel City should be worried about is their semifinal game on Saturday, where they are likely to rematch against Rat City. Another loss there would send L.A. to the third-place game. No team wants to be there if they can avoid it with a semis win. Should Angel City wind up there, or in the finals against VRDL, we’ve got them going for the gold and getting a trip to Champs with a 2nd or 3rd place finish in Vancouver. Oh yeah, did we mention that Angel City knocked Rat City out of WFTDA Championships in their first game last year? The score back then was 169-101. A revenge win earlier this year, and a surprising one at that (ADCG had nearly 30 more FTS ranking points than Rat did at the time; they are currently separated by 50 FTS rank points), will set up an intriguing rubber match in the probable divisional semifinals. Seattle has had mixed results this year, however. They beat #16 Atlanta by a grand slam and lost to Jacksonville by three slams at Sibling Rivalry. #9 Minnesota, who will be the 3-seed in Madison, had a comfortable 191-129 win over Rat at the same event. #8 Arch Rival, the 2-seed next week, won by a similar margin at The Big O, 188-120. Results like those may be a sign that Rat City won’t be able to back up their previous win against the higher-ranked Angel City with another one. Part of us are inclined to agree, but a different part of us wants to believe it may be the kind of game where you should throw out the rankings and have things settled on the track. Winning or lose that game requires Rat City winning their opener, which we predict shouldn’t be too much trouble for them. This will give them two chances to go for the gold, with a slot in the third place game looking the most likely. With how the seeding distribution panned out, Philly comes into Vancouver as the strongest 4-seed. It’s also an advantage they’ve held on to despite losing V-Diva, who transferred to Gotham earlier this year. Not bad. To their advantage, they will face the (almost) weakest 5-seed in the 4/5 Friday game. That’s an advantage they’re going to need, considering who that 5-seed will be. Still, we like to think backwards in these previews. If the seedings hold—as they are more likely than not to do in the top half of WFTDA D1 tournament brackets—and Philly winds up playing Rat City on Sunday, it’s going to be a wild one. Last year the two teams were in the same position, with Rat City advancing to Champs 178-154 at Philly’s expense. Some of PRD’s key scores: #7 Jacksonville also played Philly, with Jax winning by a slightly larger margin (161-138) than did Rat City. The day before, Philly lost to #15 Tampa by about the magnitude (154-132). In a May away game, Philly won by 32 points over #21 Boston. We think it will be enough, however, for Philly to go for the gold and to take their shot at Champs in the third place game. The home team! 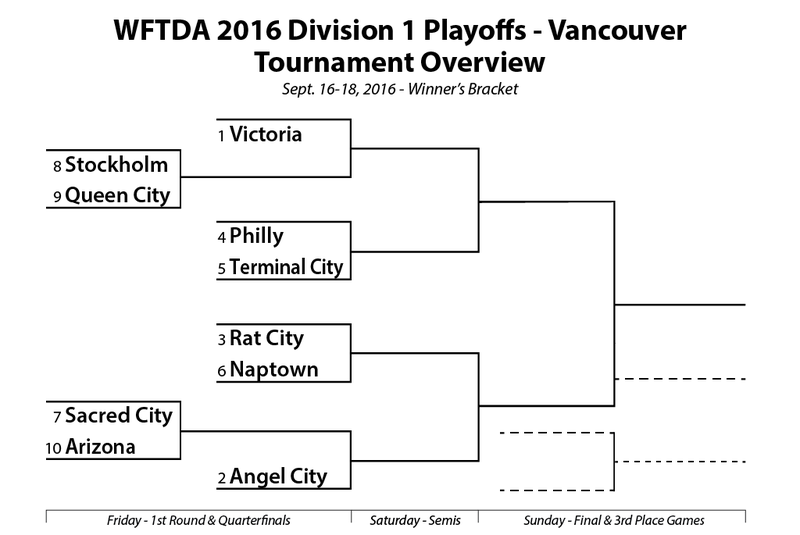 Vancouver’s own Terminal City is in a spot where you’d expect home-field advantage to help achieve victory in the 4/5 matchup, on to the third place game (via a beating from the top seed)…and dare we say it, all the way to WFTDA Championships? Hell, it worked for Montreal! We’re not sure if Cinderella will come knocking twice. Like Philly, Terminal City lost a big part of their offense this year. The derby-retirement of Evada Perón means that at least 40% of the team’s scoring needed to be replaced. The team’s results this year throws into question whether or not that has completely happened. The most telling weekend was at Pac Destruction in Los Angeles, where Terminal City played two high-level opponents. Angel City, this weekend’s 2-seed, beat them easily 252-69. Bay Area—who lost to Montreal and will not be going to Championships for the first time in a long time—managed to beat TCRG by five points, 178-173. With a 173-154 loss to #24 Helsinki also on their schedule, we have to be bearish towards Terminal City even with home field advantage. Our non-binding, it’s-totally-okay-if-we’re-wrong verdict? Settling for silver, with the inside track for a 5th place finish. Last year, the Tornado Sirens found themselves in the Division 2 playoffs for the first time. They finished the season strong with a 3rd place finish in their tournament, missing out on a spot in the D2 Championship round by a mere 24 points. Some strong results early in the year helped Naptown jump up in the WFTDA rankings and back into the D1 playoffs for 2016. That’s well deserved, but given how Naptown’s season panned out they may be over-ranked. At the time Naptown played them, #97 Demolition City was coming off of a playoff appearance and was still ranked in the top 60. After Two 350-point blowout wins against them in March and April, and a respectable 186-141 loss to #40 (#28 at the time) Steel City Naptown jumped up more than 20 spots to #25. After old games dropped out of the calculation, the settled on #22 for the playoffs. Honestly, Naptown got a little lucky playing against teams that were ranked high but on their way down. More recent results paint a more truthful picture of how Naptown is actually playing. The biggest tell is Naptown’s 175-168 ECDX win over #55 Blue Ridge. A win over a 2016 D2 finalist would be great if Naptown was in the D2 playoffs…which they are not. Flat Track Stats reflects these wishy-washy results, putting Naptown as the weakest of the ten teams playing in Vancouver this weekend according to their ranking system. If any team is going to lose their place in the seeding begging for bronze, it’s going to be this one. The 2015 WFTDA Division 2 champions have graduated back to the D1 playoffs, having previously been there in 2013. This year, all of Sacred City’s losses have come against much stronger opponents. Major victories for Sacred this year include a 218-157 win over #32 Windy City, a 253-156 win over #50 Kansas City, and a big 265-67 win over #56 Emerald City. But we like those losses, which show Sacred City isn’t afraid to rumble with the big girls. We rate this team as settling for silver in Vancouver, with no chance of getting back to WFTDA Champs this year. They’ll certainly be happy to try improve their standing in the Division 1 playoffs, though. Stockholm has come to the United States to play opponents and build up their rankings in the past two years. In 2014, it was Beach Brawl. Last year, ECDX. This year, the Swedes elected to remain in Europe1See what I did there? #brexit #swedstay to maintain their spot in the playoffs. They slipped a bit, entering the 2015 brackets as a #5 seed. For 2016, they’re #8. They didn’t step foot in America for a game, but a bit of America came to them in the form of #35 Detroit, who toured the Old World in March and beat Stockholm 171-160. #14 Montreal (+77 points) and #24 Helsinki (+46) also beat them, with the scores respectable enough to keep Stockholm’s stock high enough for a return trip to North America and the Division 1 playoffs. Stockholm is shown as the weakest team of the bunch in the 7/8/9/10 zone, according to Flat Track Stats. In fact, their FTS ranking is below their WFTDA rank, which can’t be said for the teams below them. We don’t know how much of a difference not making the extra trip across the Atlantic will make, but for now we’re saying Stockholm will be begging for bronze and hoping to avoid playing at first light on Sunday. Buffalo’s flat track roller derby team has had a great season, going undefeated in sanctioned play. None of those games have been particularly close, though. The average margin of victory in their ten wins was almost 170 points. The closest win was a solid one, however. In June, Queen City defeated Steel City 212-156; Steel finished 9th in Columbia last weekend. That’s a good indication that the Furies are playing well for their ranking, and may do well to settle for silver and take advantage of the weaker, higher-seeded teams above them. Like Queen City, Arizona is coming into the playoffs in about the same spot that they were in last year. Arizona fell a bit, but was safe enough to get in as the 40th and last team into Division 1 this year, edging out #41 Charm City by 11 WFTDA ranking points. Befitting of a team on the border, Arizona’s wins have come over Division 2 teams, and most of their losses against teams higher up in Division 1. Their most notable good game was against #23 Santa Cruz at Clover Cup, where AZ lost 171-113. Others of note were from Besterns in Denver, where Arizona beat #45 Wasatch by 56 points, but lost to #38 Rocky Mountain by a 138. While putting together this preview, we noticed that every single game Arizona has played in the past three seasons has taken place at a multi-day/multi-bout event. It seems the Terrors are comfortable playing several games in a row. They’ll get to do that again in Vancouver, though the question is whether they’ll get to play in three games or four. We’re pretty sure Arizona is good for a win somewhere along the way, meaning they’re settling for silver and will look to place higher than they started.